The squirrels in the back yard are at it again...teaching me lessons. We've had an unusually warm winter so, instead of shivering in their nests, the squirrels are out to play. And there seem to be an unusual number of small ones for this time of year, too. So the other day, four younger looking ones were running along the utility lines, chasing and playing. When they got to the utility pole, they chased each other up and down. Then there was some sort of argument and three ran off with one lagging behind. Then the lagger came back, climbed up the pole, all the way to the top where he stood on his hind legs and touched the very top of the transformer with his paw, just within a breath of the live wire! I audibly cried out "no" when I saw it. My god, why would he do that? There didn't seem to be any other reason for him to climb all the way to the top by himself and do that. But it turned out the squirrel was fine. He ran back down the pole and his friends joined him and they ran off. Since then, though, I've witnessed more feats of incredible daring from the local squirrels. A couple days after the transformer incident, I'm sitting outside and my dogs go after a squirrel, who escapes easily up the neighbor's tree. Then that squirrel makes an easy hop into a tree in my yard. Then he leaps, spanning a chasm of maybe four feet to my stump and he's 20 feet off the ground...if he miscalculates, he will land in my dogs' mouths. I literally gasped aloud. Without missing a beat, he then sails a good six or seven feet off the top of the stump to a tangle of brush behind. Granted, he lept from above but it was a shocking, gravity-defying leap. It is not the normal path they take, by any means. This guy was an athlete among squirrels. Then yesterday, I saw two squirrels chasing each other on the telephone line. 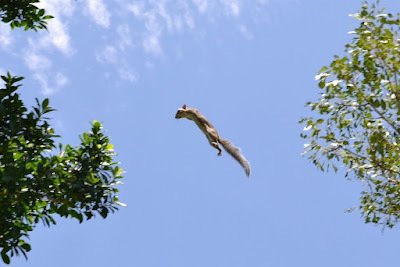 As they are running at breakneck speed, one literally flips over so he's running along the line upside down, directly beneath the other squirrel! I can't swear it's the same guy, but there is certainly a daredevil in our midst. There was a squirrel like this many years back that used to make me gasp in awe. Maybe they are from the same distinguished line of super-atheletic squirrels. It also occurred to me...maybe touching the transformer was a "dare". Maybe it's part of the tradition of daredevil squirrels. A ritual, of sorts. Maybe it's a way of releasing fears...and claiming fearlessness. I've been watching the squirrels for years. Some are cautious. Some are just normal. And every once in a while I see one be super daring like the squirrel who made the leaps. I know, with dogs, a low fence will keep a capable jumper in if the dog never realizes he can jump the fence. So many dogs will see a fence and think "I'm trapped". But more daring dogs will find a way. My childhood dog, Valcour, was like that. It was impossible to contain him. We moved once, a few miles down the road from his girlfriend, Sunny. Sunny lived behind a six foot wooden fence. Valcour somehow broke free and made his way to Sunny more than once. One time, he was gone for days. No lie...when he returned, he returned without his balls. He had somehow managed to castrate himself on his journey. After that, the poor boy lost his randy nature, got fat and stopped running away. Not sure there's a moral to that story or not...haha. In order to know you can jump fences, fly through the air or run on a wire upside down, however, you have to take the risk of jumping a fence, flying though the air or running upside down on a wire. Not all can do that. But in order to know you're capable of doing something, you have to take that risk at least once. Sometimes, though, you have to break through a wall within you before you're ready to attempt flight. So you do something totally random like showing a live wire at the top of a pole you're not afraid. And if you're not afraid of the live wire, then flying into some brush is a piece of cake. I see where I could use a live wire to shake me out of complacency right now. Not sure what that translates to in my life though, but it's got me thinking. I feel like I'm at a point where "comfort" and the status quo is beginning to suffocate me...like I'm at a critical juncture between eternal stagnation and perpetual thriving and, although my choice would seem obvious, I don't seem to be making it. Momentum has been pointed toward stagnation for so long, it seems. I remember hearing a long time ago that you should make a big change in your life every ten years or so. Whatever change I made ten years or so ago—or didn't make, I suppose—led me to and through some heavy, dark years. I had forgotten all the awesome things I'm capable of, and all the things that fueled my spirit. It's time for me to remember that, even though I'm older and tireder and creakier, I can still fly.